In 1995, my mother was diagnosed with breast cancer. I remember this clearly. It was shortly after the birth of my first son. It was a fluke the way she was diagnosed, really. Some unexpected bleeding in the middle of the night led to a trip to the emergency room, where the cancer was discovered. One of her tumors had ruptured, which led to the bleeding. When you hear the word “cancer” in relation to a family member or yourself, it prompts a whole array of emotions that you may have never experienced before. But the one emotion I remember my whole family clearly feeling during that time was fear. No matter what doctors say the prognosis may be, with cancer, you never know. 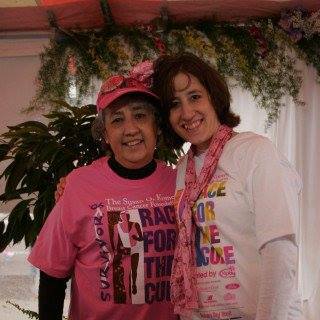 Prior to her diagnosis, my mother had never had a mammogram. She hadn’t been doing her self checks. Thankfully, that tumor ruptured. Had it continued to grow and spread, it could have turned out way worse. By the grace of God, it did not. My mom was one of the lucky ones. Others, like a dear friend of hers, was not. The disease took her life 4 years ago. While that experience was scary, I am grateful for the reminder that we need to take care of ourselves. That means doing monthly self-breast exams and annual mammograms after the age of 40; or whenever your doctor recommends you start getting them. I’ve had a couple myself and while they are not the most pleasant experience to go through, there are a lot worse things; and the benefit of early detection outweighs any unpleasantness. So to kick of National Breast Cancer Awareness month, Pay attention to those girls!!! Tags: Breast Cancer Awareness. Bookmark the permalink. Previous post ← And They Think I Actually Know Something. Such important things to remember in taking care of ourselves! !